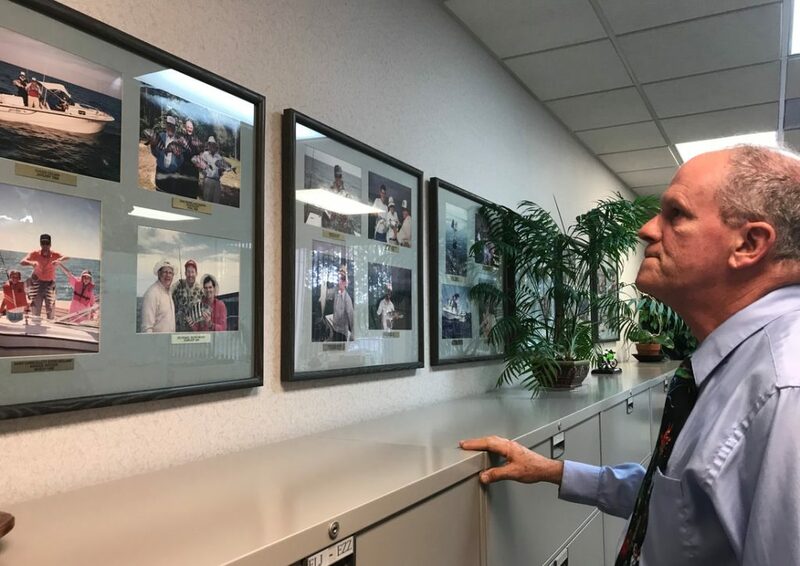 Being a member of the Gainesville Offshore Fishing Club is something of a family tradition for Ed Ellett, whose office walls are filled with mementos of fishing expeditions with family and club members. His father was a founding member of the recreational saltwater fishing organization, which formed 50 years ago to support inshore and offshore fishing in North Central Florida. Every year since joining the club in 1979, Ellet has aspired to win the Ten Slam Award, a tournament for members that specifically targets ten recognized species of legal fish — among them Flounder, Cobia, Grouper, King Mackerel, Redfish and Sheepshead. And this year is no different for the 64-year-old former president of the fishing club. However, Karenia brevis, commonly known as Florida red tide, has affected Florida counties along the Southwest coast for the past 10 months. The toxic algae continues to aggressively destroy marine life, restaurant establishments and the livelihood of certain South Florida communities. Ellett, who considers his time out on the water as a wonderful gift, hopes the harmful toxin won’t spread to areas like Cedar Key, Suwannee, Crystal River, Keaton Beach and Horseshoe Beach, where he spends his time during fishing trips. Red tide can spread anywhere in Florida so it should be on everyone’s radar, said Dr. Todd Osborne, assistant professor of aquatic biogeochemistry at the Whitney Laboratory for Marine Bioscience in St. Augustine. The right amount of nutrients and warm water temperatures create the perfect ecosystem for harmful algal blooms to flourish, growing exponentially while releasing toxins that are causing serious environmental problems. Fish, birds and marine life are dying — and even humans are suffering respiratory irritation from inhaling offshore winds. Osborne said when nitrogen, phosphorus and iron are available in quantities, this allows for explosive growth of algae. These organisms can easily be found in North Florida cities like Jacksonville, Cedar Key and Panama City. Osborne voiced concerns that the seafood industry in Florida could shut down rapidly if red tide continues to affect large areas where commercial and private fishing usually take place. Lee Deaderick, owner of a locally owned, traditional fish market called Northwest Seafood Inc. said the media attention to red tide is overblown and argued that the recent outbreak is nothing new. He added that the waters in the Gulf of Mexico, where he buys his shellfish and other products, have not been affected by red tide. The northern regions of Florida are tested weekly and currently no boats are fishing south of Tampa Bay. “Customers need to know, the general public needs to know, from a seafood safety perspective, I can’t say that state government always performs to optimum but when it comes to monitoring the water for red tide, they have a very good track record,” Deaderick said.